We have written the equation of a line in slope intercept form and standard form. We have also written the equation of a line when given slope and a point. Now we are going to take it one step further and write the equation of a line when we are only given two points that are on that line. This type of problem requires three steps. 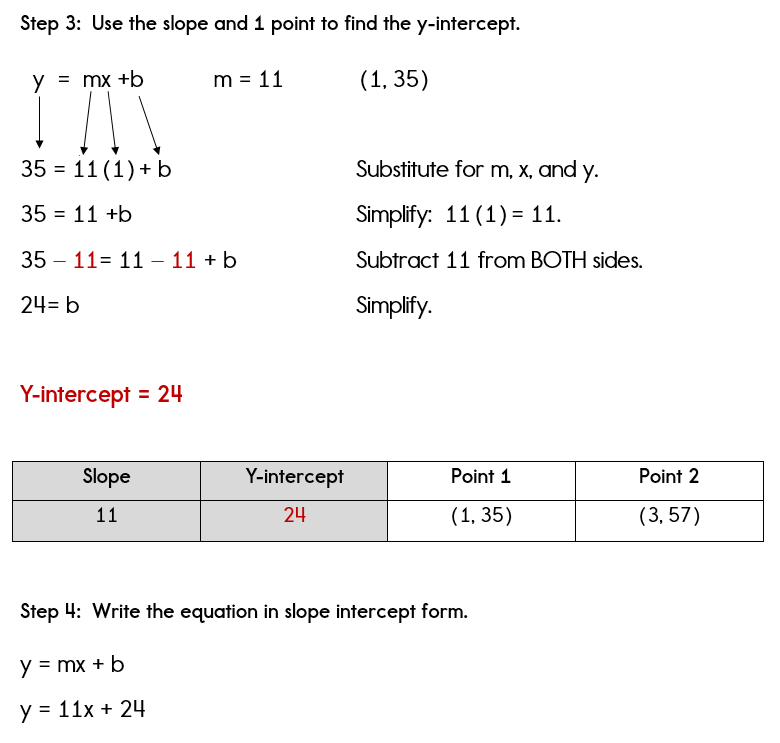 Use the slope (that you found in the step above) and one of the points to find the y-intercept. 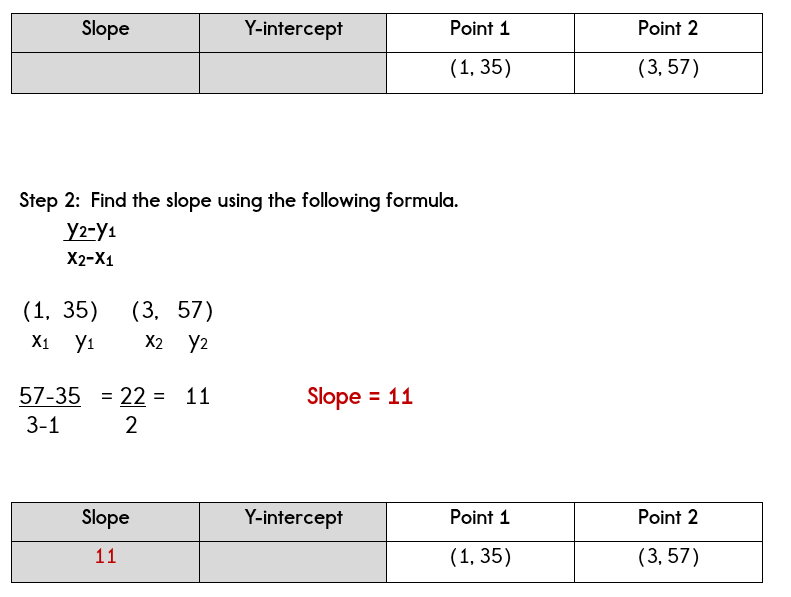 Write the equation in slope intercept form using the slope and y-intercept. If needed, you can then rewrite the equation in standard form as well. Write an equation for the line that passes through the points (1,6) and (3,-4). We know that we are given two points. Let's use a chart to help us organize our information. In the chart below, notice that the slope and y-intercept are grey. 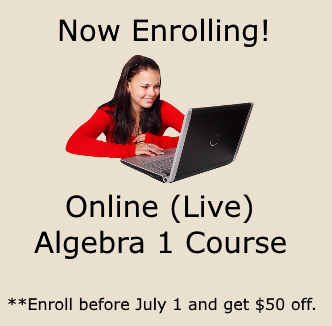 These are the two values that must know to write an equation in slope intercept form. We know that if we have two points, we can use the slope formula to find the slope. Now we know the slope and we just need to find the y-intercept. 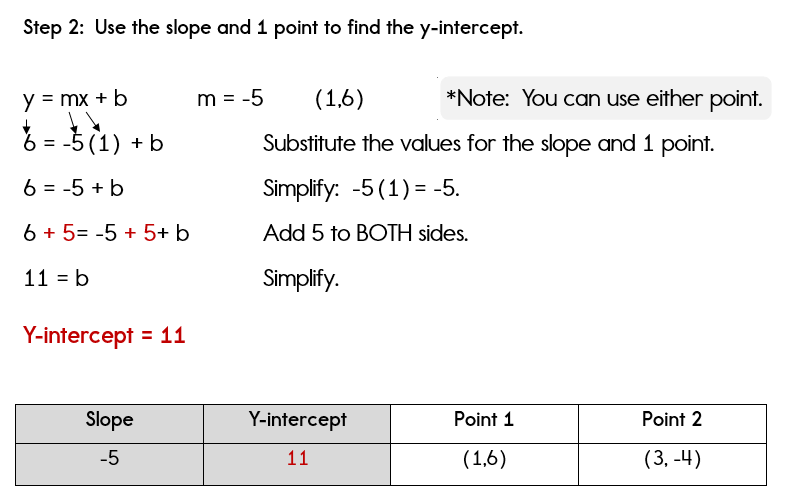 If we know the slope and 1 point, we can find the y-intercept. Step 3: Write the equation in slope intercept form. 1. Find the slope using the slope formula. 2. Find the y-intercept by substituting the slope and the coordinates of 1 point into the slope intercept formula, y = mx + b. 3. Write the equation using the slope and y-intercept. Ok, now let's apply this skill to solve real world problems. Now you will have to read through the problem and determine which information gives you two points. Remember a point is two numbers that are related in some way. NOTE: Also remember, that when identifying a point from a word problem, "time" is always the x-coordinate. The mathematics department sponsors Math Family Fun Night every year. In the first year, there were 35 participants. In the third year there were 57 participants. Write an equation that can be used to predict the amount of participants, y, for any given year, x. Based on your equation, how many participants are predicted for the fifth year? Step 1: Identify your two points. In the third year, there were 57 participants. This can be written as (3,57). Let's enter this information into our chart. Now that we have an equation, we can use this equation to determine how many participants are predicted for the 5th year. All we need to do is substitute! We will substitute 5 for x (x is the year) and solve for y. There are 79 participants predicted for the 5th year. And that's it! Not too bad, is it? I hope that you are learning how to recognize points, slope and y-intercepts when reading real world problems. 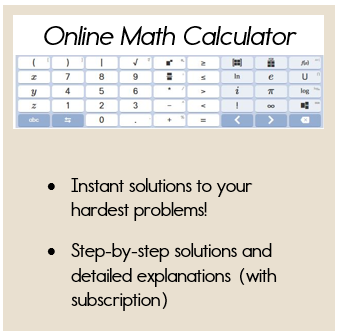 You may also want to visit our lesson on writing equations using point-slope form.